Just two months ago, a lawsuit was filed against Snapchat when a former employee of the company alleged that CEO Evan Spiegel had said in 2015 that he didn’t want to expand the business into “poor countries like India and Spain”, which of course wasn’t true. However, many Indians chose social media to express their anger. Hashtag #boycottsnapchat started to trend and the photo giant social media platform was flooded with 1 star and negative ratings on Google and Apple Appstore. But amidst this boycott, there was one more person other than SnapChat CEO, who was caught up in this turmoil and that was his fiancée Miranda Kerr. Well, that was the story of Evan Spiegel, CEO of SnapChat but if you really turn towards the search pattern of Indians on Google, it’s absolutely disturbing. In this case, we tried finding out what Indians search about Indian male and female journalists on Google and this what we found. 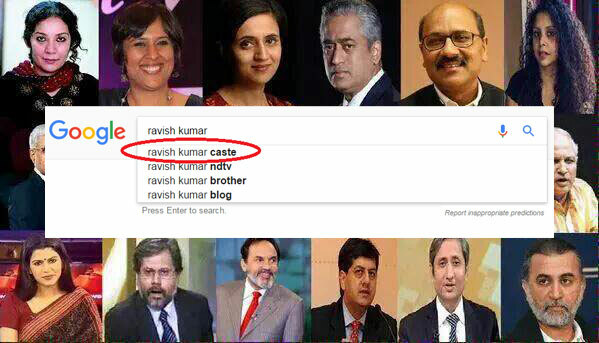 If you look carefully, the most searches about Ravish Kumar is about his caste. We went further and modified the search and then, it went even more specific. People were wondering if Ravish Kumar is a Dalit. Prannoy Roy has been in news lately because of CBI raids in his house but Indians are more interested in his daughter on Google. See the pattern? All right let’s move on. In Barkha’s case, people are more interested in her spouse than her journalistic career. When I typed “Barkha Dutt is”, I expected the result to be “Barkha Dutt is a journalist with….” but this is what people have been searching. First search result is his salary and then followed by searches on his wife. Wait till we write “Anjana Om Kashyap is” on Google. For your information “Bhumiar” is one of many Hindu sub-caste. This is just the case of Indian journalists. Just look around and find any influential identity and type out their names on Google and you’ll find either people are interested in their wives & caste (For males) and salary, caste and husbands (for females).